In medium bowl, beat cream cheese, Gorgonzola cheese, honey, red pepper and salt with electric mixer on low speed 1 to 2 minutes or until mixed and fluffy. Stir in cranberries and pecans. Cover and refrigerate at least 2 hours until firm enough to shape into a ball. Just before shaping, melt butter in 8-inch skillet over medium heat. Add bread crumbs; cook and stir 2 to 3 minutes or until golden brown; transfer to medium bowl. Let stand 5 minutes. Stir in parsley. Shape cheese mixture into 1 large ball. Roll in toasted bread crumb mixture; place on serving plate. Serve with crackers. For mess-free cheese ball shaping, place cheese mixture on a sheet of plastic wrap, and bring edges together to form the cheese ball. 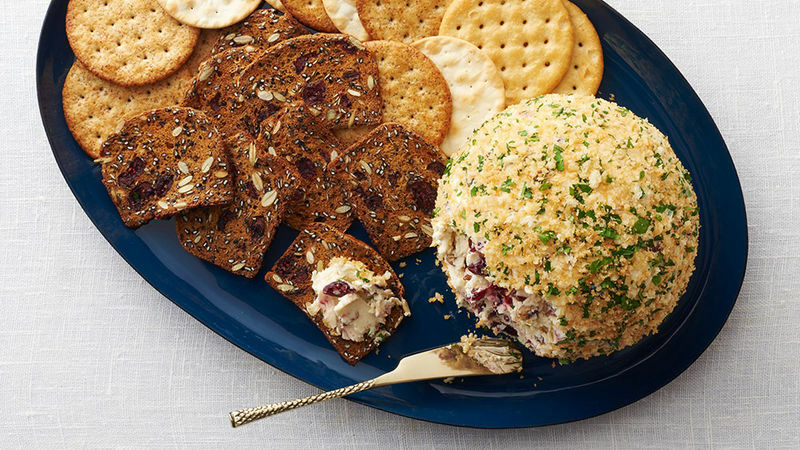 This cheese ball is delicious served with buttery crackers or crispy wheat crackers. To toast pecans, sprinkle in ungreased heavy skillet. Cook over medium heat 5 to 7 minutes, stirring frequently until pecans begin to brown, then stirring constantly until pecans are light brown.